Tasklist manager available from Tools : Tasklist (e.g. by pressing F4) can be used to edit, prioritize and sort tasklists and all sorts of to-do lists. For example, your prioritized shopping list can be kept in SuperMemo as a tasklist. To be sure that you go on with your major investments starting with those of highest benefit, you might list your planned purchases using price of the purchase in the Time field and, for example, daily time savings in minutes in Value. You could also use other measures of value. For example: degree of satisfaction from the purchase, the maximum price you would be ready to pay, or annual return on investment, etc. This approach would make sure that you never waste your time or money on petty impulse purchases. With tasklists, you can always be sure that you proceed methodically starting from the most valuable investments. Last but not least, tasklists are invaluable for those studying at school or university, where most learning material is not presented in electronic form (e.g. in paper textbooks). In such cases, subject topics (e.g. "Pythagoras' theorem", "Kennedy assasination", etc.) must be prioritised before importing to SuperMemo (in contrast to the incremental reading process, which allows prioritisation after importing). For example, if you have 20 minutes to study, you can spend 3 minutes importing tasks, and 17 minutes importing the learning material, as prioritised by your tasklist. During the importing stage you may either choose to manually type in the most important material, or else simply see if you can find an electronic version of it. To edit a selected field, click it, type in a new value and press Enter. To sort the tasklist choose Ctrl+S. To edit the parameters of a task, choose Ctrl+Shift+P in the same way as you do it in the element window (or Ctrl+E as in Plan). Note that you need to press OK to save the parameters (Esc will cancel the changes). If this is your first experience with the approach based on priority=value/time, the order of your shopping list may be a surprise! For exemplary tasklists and their use, see: Break free from work overload! You mention the value of tasks. How do I know how much a task is worth? What is the difference between a reading list and a tasklist? 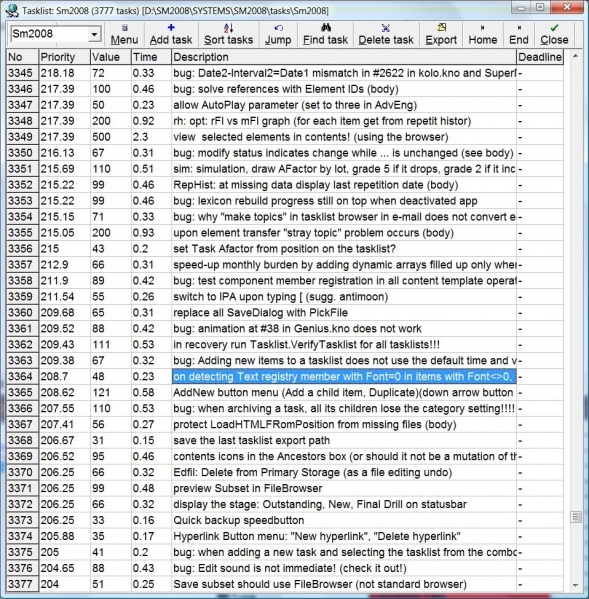 You suggest that tasklist valuations can be used to prioritize material for learning. But for categorizing the material in a exam there is no market! So how do I evaluate the prices? Why don't I get the priority halved in tasklists if I set the deadline half-time to today? Does it make sense to put on tasklists things that are not feasible in a near future?